Woman found dead near floodwaters north of Hokitika. Police have named the woman found dead on the West Coast after being swept away by floodwaters. She was Gloria Reardon-Hirst, 66, of Arahura Valley. Acting area commander Senior Sergeant Peter Payne said it appeared Ms Reardon-Hirst got out of the vehicle she was driving and tried to cross the flood waters on foot. She was then swept away in the strong-flowing current of surface flooding on Arahura Valley Road, he said. Police are investigating and her death has been referred to the coroner. This comes as rain continued to fall on the West Coast this morning after a "significant" amount overnight. It has now eased in the area and is making its way up the North Island, through Wellington and Taranaki. MetService forecaster Angus Hinds said late this morning that 300mm to 400mm had fallen in the area, but the heaviest falls and strongest winds were on the way out. A heavy rain warning remained for Buller, further north, until about 11am. The Westland Civil Defence Controller, Simon Bastion, told RNZ this morning it had been a "horrendous and scary 24 hours" on the coast. Some parts of Westland had up to 800mm of rain during the downpour and the town of Haast was experiencing a one-in-100-year flood. Westland District Mayor Bruce Smith said he expected the state of emergency - which remained in place on Wednesday afternoon - to be lifted "today or tomorrow" and with the Waiho Bridge out of action, the only way south now was by helicopter. "It is really unusual to get a 100-year event, right across Westland. Normally it is concentrated in one place, but this was right across, so it has been a really big event. The Haast River was at the highest level it has ever been. We had 800mm of rain, I can't remember there ever being that much in my life." Work was to begin immediately to replace the bridge and it was hoped the SH6 would be reinstated within 10 to 14 days, Civil Defence said. Schools in the area are closed and there were power disruptions at Haast and inland from Hokitika. Seven people had to be evacuated from their properties in Waiatoto. Some 450 tourists were kept in Franz Josef overnight, and they would be allowed to travel north later today. However, the collapse of part of the Waiho Bridge near the Franz Josef township has cut short the tourism season. Westland's Deputy Mayor Helen Lash said told RNZ this morning road the is the only land route into Franz Josef from the south, and locals are "devastated" by its loss and the damage to the local economy. The West Coast Emergency Co-ordination Centre and Westland Emergency Operations Centre would remain operational throughout the day and river levels across the region would be monitored. Minister of Civil Defence Kris Faafoi arrived in Hokitika this morning and would be visiting various locations in Westland. A welfare centre at Haast has been opened. A Community Information Centre to help with displaced residents and tourists has been set up at the Hokitika iSite, on the corner of Weld St and Railway Tce from 08.30 am. If you require assistance with welfare, please contact 0800 474 834. 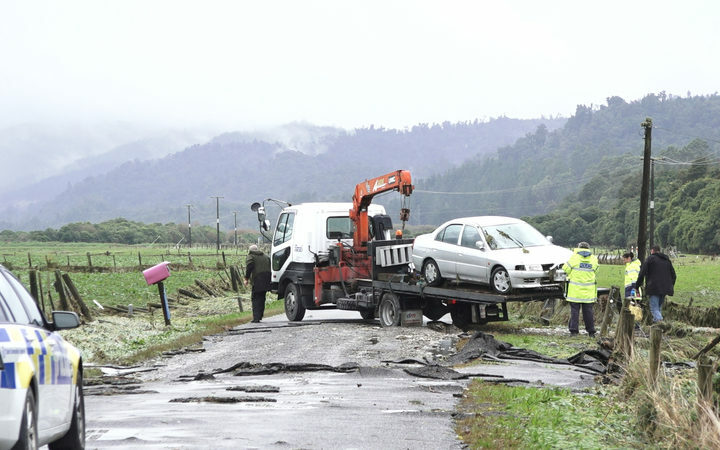 Haast resident Kerry Eggeling told the Otago Daily Times this morning the clean-up in the area would take weeks, while some homes were so badly damaged by floodwaters they could take six months to repair. Driving down North Turnbull Rd this morning, Mr Eggeling said the flooding was "getting up there" to the worst he had ever seen. "There's been a hell of a lot of damage to fences and property. There's going to be a lot of tidying up to do. "I just went up South Turnbull Rd and there's huge big trees lying over fences where the river has come up . . . there's hundreds and hundreds of metres of fences just flattened." Several homes had been inundated, he said, while there would also likely be dozens of whitebait baches also affected. As rain continued to pelt the area yesterday afternoon, the Haast River got as high as Mr Eggeling had seen, and began running across the junction of SH6 and the Haast-Jackson Bay Rd at a depth of 150mm. "I don't think it's ever run over there before. When it starts going over the road like that, you just can't travel." Mr Eggeling said a big clean-up operation was on the cards. "It'll take weeks and months for the homes that were inundated. It could be six months before the owners are back into them." • Some local road closures remain in place. These are being assessed by contractors and will reopen as soon as possible. Care should be taken on all roads due to surface flooding. Westland District councillor Helen Lash told RNZ local contractors know the roads are the bloodline to the region and they'll be determined to get them open as quickly as possible. The Westland District Council advised that Ritchies Bus Services had suspended all bus services today for the whole of the West Coast. A state of emergency was declared in Westland at 5.45pm yesterday, shortly after the Waiho River Bailey bridge on State Highway 6 at Franz Josef was wiped out. Jacob Schonberger, a Kiwi Experience bus driver from Dunedin, said he heard the ''biggest crack'' as the Waiho bridge fell away. The bridge would remain closed until it could be safely replaced. At 5pm yesterday, Civil Defence staff said the Haast River was close to its record high of 7.6m, but had levelled off. It had spilled over its banks in places. The Waiho River was running at 7.6m and had dropped from its peak, while the Hokitika River was at 5m and rising. Before noon homes in Waiatoto were evacuated after the Waiatoto River breached its banks. In less than 48 hours the Haast River, at the Roaring Billy catchment, had received 548mm of rain, which was nearly 10% of its normal yearly rainfall. A water level recording of 7.423m was the second-highest on record at the station since 1969.